The American Staffordshire terrier is famous for their fighting ability. "Loyal, intelligent, determined, tough, devoted- a Prince amongst dogs." It is no wonder this powerful breed has a muscular build. However, there is much more to this wonderful animal than its unfortunate heritage as an aggressive fighter. Many owners praise this breed's affectionate and loyal family nature. The ancestors of today's amstaff were known as the Bull-and-Terrier Dog, Half and Half, and at times Pit Dog or Pit Bull Terrier. They were later given the name Staffordshire Terrier, after the English Region of Staffordshire where it was first developed. It was not until 1870 that these dogs were brought to America. American dog breeders preferred this strong, agile breed as a fighting dog and worked to increase the weight of the dog. They also concentrated on enlarging the breed's head size. When dog fighting became illegal in the USA, American breeders developed two strains of dog. One strain was developed as a show dog that is today's American Staffordshire Terrier. The other strain was developed as a fighting dog and is classified as the American Pit Bull Terrier. 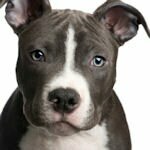 Despite the best efforts of animal control officials and animal lovers, the American Pit Bull Terrier is still used as an illegal fighting dog in North America. The American Staffordshire Terrier was first accepted for registration in the AKC in 1936, as members of the Terrier group. The name of the dog breed was officially revised in 1972.At this time, the AKC made a distinction between the Staffordshire Bull Terrier of England and the Staffordshire Terrier of America. 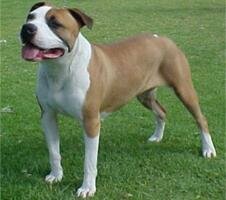 The Amstaff is a very muscular and powerful dog with a large bone structure. This solidly built breed weighs between 57-67 pounds. While this dog breed may have the look and build of a fighter, it is actually very loving and protective of its family. They are not ideal apartment dogs, but they will survive in this situation if the owner of this active breed has the energy and stamina to keep up with the dog. This dog breed lives to please its owner, but may be hard to housebreak. They are also very active, so will need to take frequent long walks. A home with a securely fenced yard is a better fit for the breed. However, they are sensitive to cold and need to have a warm environment. During winter months you should be prepared to bring your dog indoors after it burns off some energy with a romp in the yard. The American Staffordshire terrier is a gentle happy, outgoing dog. They play well with children and relate well to adults with very little training. However, you should never leave young children or other pets in an unsupervised situation with any big, strong dog. Amstaffs make excellent guard dogs. They are territorial and very protective. The breed's original fighting qualities are still evident toward enemies and intruders to the owner's property. They should be socialized so they accept guests and other animals. Early training, while your dog is still a puppy and you are stronger, is a must. The American terrier breed is generally healthy. However, this breed should receive yearly health screenings to rule out some hereditary traits like cataracts and congenital heart disease. They are also prone to hip dysplasia. Be sure to ask your breeder if the parents have been screened for this hereditary trait as well. The short coat of the American Staff Terrier is easy to groom. Brushing your dog's coat on a regular basis to remove loose hair should suffice, since the breed does not shed profusely. You should also brush its teeth once a day and clip its nails if they don't wear down on their own. The American Staffordshire Terrier is a Protective and Loving Dog. This wonderful dog breed will wholeheartedly protect its beloved family. These characteristics may just make this breed an excellent choice for you. 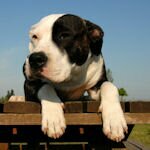 Dog Breed Family The Amstaff belongs to the family known as Terriers.